AT ALIVE AFTER FIVE: BOISE NATIVE BLUES FAVORITE JOHN NEMETH! 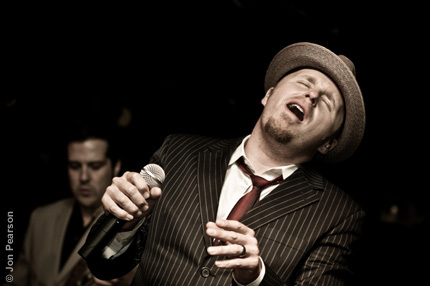 John Németh (johnnemethblues.com) is a rising blues star; a singer steeped in the tradition and reminiscent of B.B. King, Ray Charles and Junior Parker, and a harmonica player of riveting intensity and virtuosity. His decade long career has found him opening for Robert Cray, Keb Mo’, and Earl Thomas. Performing major music festivals around the United States, Europe, Canada and Asia has brought him critical acclaim. John’s origins are an unlikely breeding ground for such an impressive blues talent. A 30-year-old native of Boise, he grew up singing in a Catholic church and started playing in local bands as a teenager. Németh was a featured artist with Anson Funderburgh and the Rockets in 2005 and 2006 as well as a featured artist with The Junior Watson Band in 2002. The Cascade Blues Association selected Németh as a crowd favorite at the Portland Waterfront Blues Festival in 2002, and the Washington Blues Society called him the show stealer at the Winthrop Rhythm and Blues Festival in 2003. The buzz around John Németh is substantial, and his Blind Pig debut, Magic Touch, delivers the goods in spades. From the opening track, an ambitious and fully realized reworking of Junior Wells’ classic “Blues Hit Big Town,” John’s emotive, smooth voice and stellar harp playing introduce a virtuoso of rare depth and power. John’s uncanny blend of retro-modern blues and soul music will delight purists and young hipsters alike. Next RX EXCLUSIVES: PEARL JAM BOX SET, ROSE HILL DRIVE AND SEASICK STEVE!